An applets are client side web based program i.e executes on web browser. To write an applet developer must write access specifier public . 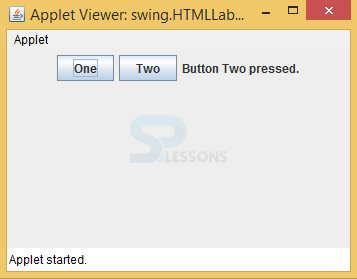 Swing applets are same as AWT applets, the variation is that Swing extends JApplet and JApplet consists of all the features of Applet because of JApplet is derived from Applet. JApplet is a high level container that includes panes.Applet life cycle uses five methods such as init(), start(), paint(), stop(), destroy() methods. The init() and destroy() methods of an applet gets executed only once where as remaining methods of an applet gets executed every time when applet comes into focus uses start() or lost focus uses stop(). Here class name should extend the Applet and this applet class available in import java.applet. *; package. Create a class that should extend JApplet to inherit the properties. Call the init() method, where invokeAndWait belongs to Swing utility classes used to update the GUI thread.Swing is not thread safe and only repaint() is thread safe in swing. If user tries to update any thing exception will be occured. If Applet is restarted then start() method will be called. If Applet is stopped then stop() method will be called. If Applet is destroyed then destroy() method will be called. Initialize GUI setup and flow layout. Create buttons, labels and add ActionListeners to the those components. Add components to the content pane. // Create  buttons and a label. // Add action listeners for the buttons. // Add the components to the applet's content pane. 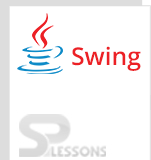 The Swing Applet Output will be as follows. When click on button one and two, it displays Button one pressed and Button two is pressed. Swing Applet won’t override paint() method. Swing Applet does not support any rules where as Swing supports threads.